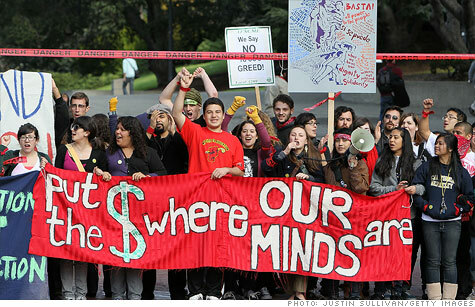 Tuition hikes at public schools have sparked student protests across the country this year. NEW YORK (CNNMoney) -- Roughly 530 colleges across the country will soon have to submit special reports to Uncle Sam, explaining why their tuition and student fees have recently surged. For the first time ever the Department of Education released a list Thursday morning, ranking colleges with the steepest tuition hikes. The report lists the top 5% of schools with the sharpest tuition increases over a three-year period for several categories. By law, the worst offenders will now be required to submit special reports to the government, explaining why costs have gone up so dramatically, and how they plan to address rising prices. The nation's largest public university, Arizona State University is among those listed, after it hiked tuition 38% from $4,971 in the 2007-2008 school year, to $6,844 just three years later. All three of Arizona's public universities were on the list -- not coincidentally, after the state government imposed some of the nation's harshest cuts on higher education. Since fiscal 2008, the state has slashed its university funding by 50% or $428 million. More statewide tuition hikes are on the way in the fall. Among the other large public universities that made the list, Georgia State University hiked tuition 46% and Alabama State University increased tuition 43%. About two-thirds of California State University's 23 campuses were also listed, for each hiking tuition between 37% and 46%. Ranking the schools by net prices -- which includes tuition and other costs minus financial aid -- Tennessee State University and Colorado State University were among the offenders who will have to submit special reports explaining their price hikes. Arts and music schools made up a large portion of the private schools listed, as did for-profit colleges from publicly-traded companies DeVry University (DV), Education Management (EDMC) and Corinthian Colleges (COCO). 0:00 / 2:22 Is Trump University a scam? So far, neither Congress nor the Education Department have laid out actual repercussions facing the schools -- but in a call with reporters Wednesday, spokespeople for the report indicated additional regulations could be considered in the future. The Department of Education also released a new interactive tool Thursday, listing the most expensive and cheapest colleges by both their published sticker prices, and their average costs after financial aid and scholarships are taken into account. Required by the Higher Education Opportunities Act of 2008, it's the first time the government has ranked American universities by affordability, in a list for consumers to easily search online. "We hope this information will encourage schools to continue their efforts to make the costs of college more transparent so students make informed decisions and aren't saddled with unmanageable debt," Secretary of Education Arne Duncan said in a release.